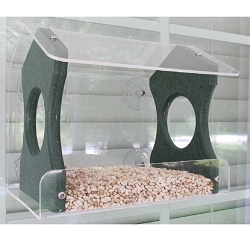 Home > Wild Bird Essentials > Bird Feeders > Eco-Friendly Recycled Plastic Feeders > Rubicon Recycled Plastic Small Hopper Feeder 1.5 Qt. 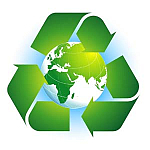 Environmentally Safe 1.5 qt. 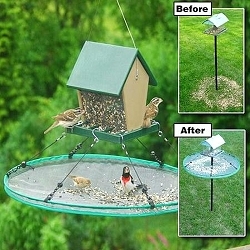 Hopper Feeder...a perfect addition to any backyard feeding station. 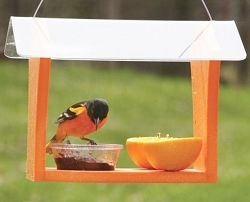 Birds will love dining in your yard for years to come with the Rubicon Small Hopper Bird Feeder. 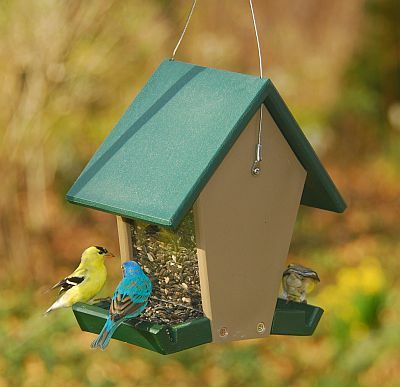 This compact feeder features an environmentally friendly design that will not fade, peel, rot, crack, chip, or warp as it is made from recycled plastic milk jugs. 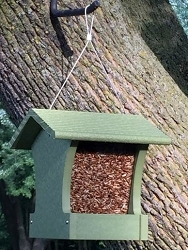 The base features raised vertical ridges which offer more perching room for birds and prevents seed from clumping in the seed reservoir. 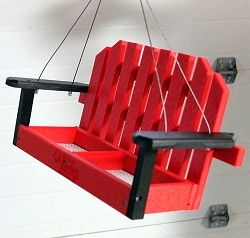 The green roof lifts up easily for cleaning and refilling, and the included wire hanger allows you to hang this feeder in a nearby tree. 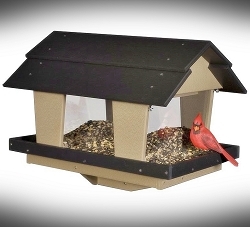 The 1-1/2 quart or 2-1/4 pound capacity offers plenty of seed for your feathered friends. 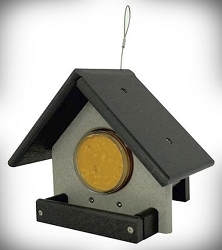 Place this Small Hopper Bird Feeder in your yard for birding enjoyment year after year. Unconditional one hundred year guarantee. 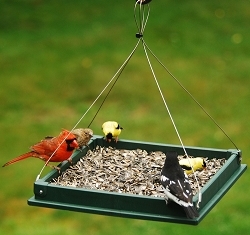 Environmentally friendly, the Rubicon Recycled Plastic Large Hopper Feeder 2.5 Qt. 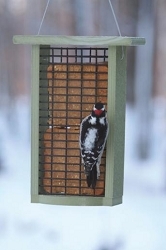 is designed to feed sunflower, safflower, sunflower hearts, cracked corn, or any mix seed or blend to a wide variety of backyard birds including cardinals, chickadees, titmice, nuthatches, wrens, finches, woodpeckers and many other songbirds.